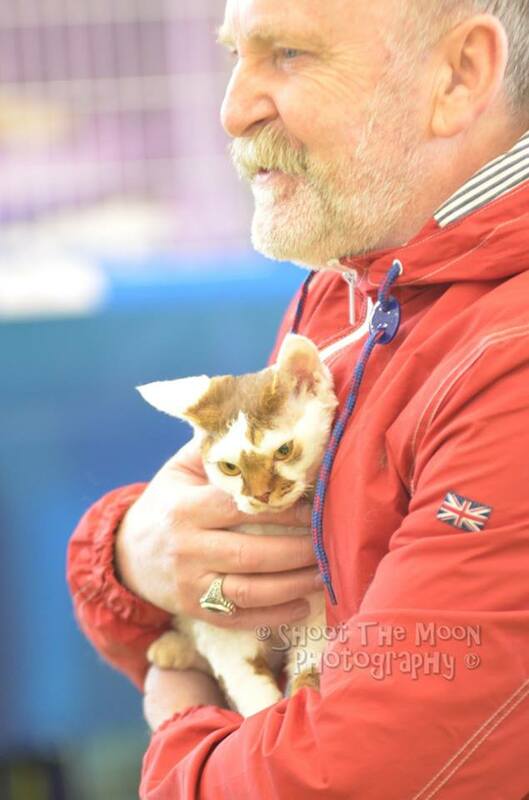 I take it that you have been spell bound by the wonderful Devon rex cat with their elflike or extraterrestrial look? We certainly have. These little pixies are alert and inquisitive, showing interest in all that is around them. By the same token, these active cats are also very much people cats and are strongly devoted to their owners, claiming a lap and a good snuggling whenever the opportunity arises. They purr incessantly, chortle and coo when intrigued by the birds outside the window and wag their tails when they are happy. Devons are an outgoing breed that run to meet you at the door at the end of a long day and tell you in no uncertain terms how much you were missed. They love sleeping under the covers with you and many will also brave the waters of a shower just to be near their person. They are driven to be with people from the moment they first toddle out of the kitten box at around three weeks of age. The mission is to find a soft hand and a warm lap. They are hearty eaters although most would prefer to steal or beg titbits from the table. This is probably an attention getting ploy. But attention is the key to living with a Devon. They are intense, personable cats. They are clowns. They are lovers. . . And they want to be involved with their people. The popularity of the house cat as the favoured domestic pet has soared over the past several years. With that growth, the growth in popularity of the Devon Rex has been phenomenal. They have a gentle voice, have a need to be with people, shed almost unnoticeably, have wonderful puppy-dog-like personalities, don't require much space and seem to be well tolerated by many allergy sufferers. Elfin Magic has worked its spell on untold numbers. Please enjoy the website as much as we have enjoyed making it. Loriendale Devon Rex Cattery is located in Christchurch, New Zealand. We live in a quiet hill suburb overlooking the city from about ten kilometers out of the central city. The house is surrounded by native bush and trees, and is almost 200 meters from the nearest road. It is a very tranquil environment indeed. The vet practice we use are Total Vets in Gloucester street, a bit of a drive but well worth it as this practice have looked after our cats for over 12 years now and have a good understanding of the breed. The house is built off the side of the hill so we live at a level of the tree tops. In "The lord of the rings" the elves lived in the tree tops in a town called Lothlorien. This is where we developed our cattery name from. Our devon's mostly live with us as accepted family members and our Neuter, Spays are never caged except for transport. Our breeding queens live with us and are isolated during the kittening until the kittens are vaccinated. Our studs live in the heated and insulated 3 berth cattery for obvious reasons.